Dentures were long considered the best solution to replace missing or failing teeth. Today, though, dental implants have become the gold standard. While dentures rest on the gums, dental implants actually replace the tooth roots, providing a strong and stable base for highly functional and aesthetic replacement teeth. Here are 5 benefits of dental implants. Dentures cost significantly less initially, but dental implants have far lower long-term costs. Dentures need relining at least annually, and they must be replaced every 5 to 10 years. Dental implants can easily last a lifetime with proper care. If you are concerned about the out of pocket expense, consider implant-supported dentures. As few as 2 implants can stabilize a removable full denture. Today’s dentures are highly natural in appearance, but they can move and shift when laughing, talking, or chewing. A partial denture attaches with a clasp that can often be seen, while a full upper denture has a hard plastic palate. These factors make dental implants a more aesthetic solution. Supported by the gums, dentures tend to rub, slip, and pinch. These issues are magnified when eating foods that are chewy, crunchy, or tough. Dental implants fuse to the jawbone to create a stable and secure base that vastly improves comfort. Dentures restore only about a quarter of natural bite strength, making it difficult or impossible to eat steak, corn on the cob, taffy, and other challenging foods. 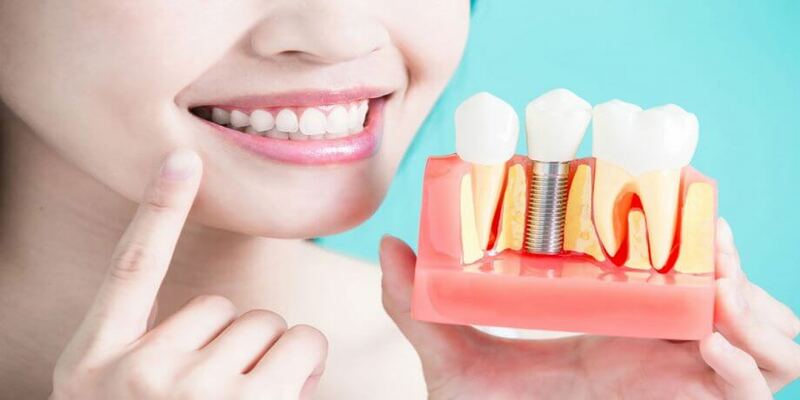 With dental implants, which restore more than 90 percent of bite strength, patients can again enjoy their favorite foods. Lost teeth trigger the process of resorption, in which the gum tissues and jawbone shrink. Over time, denture wearers can develop a sunken, wrinkled, prematurely aged appearance. Even the best-fitting dentures will also become loose due to this process. Dentures also tend to cause sores and inflammation in the mouth, raising the risk of gum disease. Since dental implants take the place of tooth roots, they stimulate jawbone growth, reversing the resorption process. They also anchor the replacement teeth, preventing sores and inflammation from developing. Like any procedure, dental implants are not right for everyone. For many people, though, dental implants are the best choice for long-term health, comfort, and aesthetics. We will review your options with you and help you make the decision that best meets your needs, goals and desires.